…it turns out that the bill offers nothing more than an illusion of the prospect of justice and accountability. It is, indeed, a cruel hoax. On September 11, 2001 Huma Abedin — Hillary Clinton’s aide for twenty years and co-chair of her current Presidential run — was working for an organization located in the offices of Saudi Arabia’s Muslim World League. That’s a Wahhabist Islamic group that Breitbart News recently reported was going to be put on a list of terror funders by U.S. government but was removed, reportedly under pressure from Saudi Arabia. 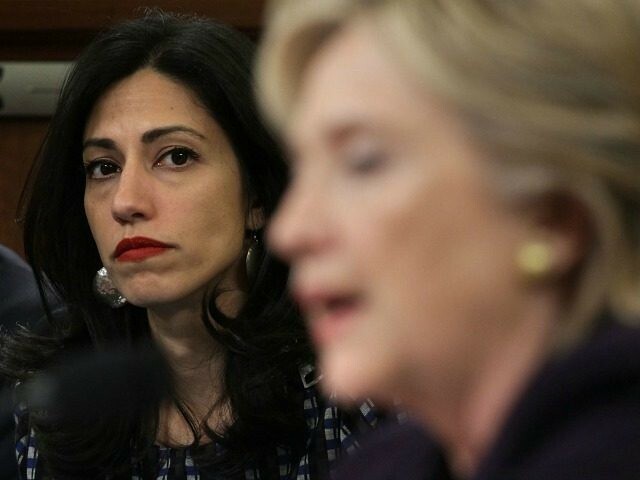 …Although she was working for Senator Hillary Clinton in 2001, at that time Huma Abedin was an unknown but influential aide, so her connection the the Muslim World League went unexamined. A Very Heavy Agenda Part 3: Maintaining the World Order from Robert Martin on Vimeo. with relevance to the extremely dangerous drumbeat and buildup to major war"
Yesterday, Hillary Clinton offered a rousing endorsement of “longtime family friend” Terry McAuliffe in his second run for Governor of Virginia. McAuliffe certainly has been a good friend to the Clintons, having once made them a $1.35 million gift which, after becoming a scandal, turned into a loan. But the most interesting parts of McAuliffe’s history often go unnoticed, including his links to the security upgrades at the World Trade Center (WTC) in the late 1990s. One of the primary companies involved in the security upgrades for the WTC was Ensec International, founded by Charles Finkel. Ensec’s Florida subsidiary had an office on the 33rd floor of the North Tower. At the same time, Finkel was an export sales executive for a company called Engesa, a manufacturer of tanks and other military vehicles for Operation Desert Storm. Engesa was a Saudi-approved supplier. Lockheed Martin subcontracted the PANYNJ work to Ensec in November of 1996.This was the same time that Carlyle Group employee and Iran-Contra suspect Barry McDaniel was hired to run operations for the highly suspicious WTC security contractor Stratesec. And just as Ensec obtained the contract to work alongside McDaniel and Stratesec, it added Terry McAullife as a director. 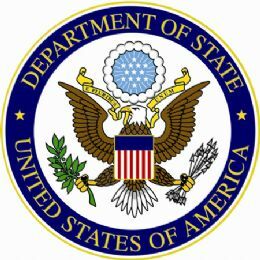 "Secretary of State Hillary Clinton gave senators a thoughtful argument this morning in favor of helping French troops in their mission to help stabilize the government in Mali, arguing that the United States has to act in advance to protect the American homeland. But she forgot two important event in making her case. "People say to me all the time, well, AQIM hasn't attacked the United States. Well, before 9/11, 2011, we hadn't been attacked on our homeland since, I guess, the War of 1812 and Pearl Harbor. So you can't say, well, because they haven't done something, they're not going to do it," she said. 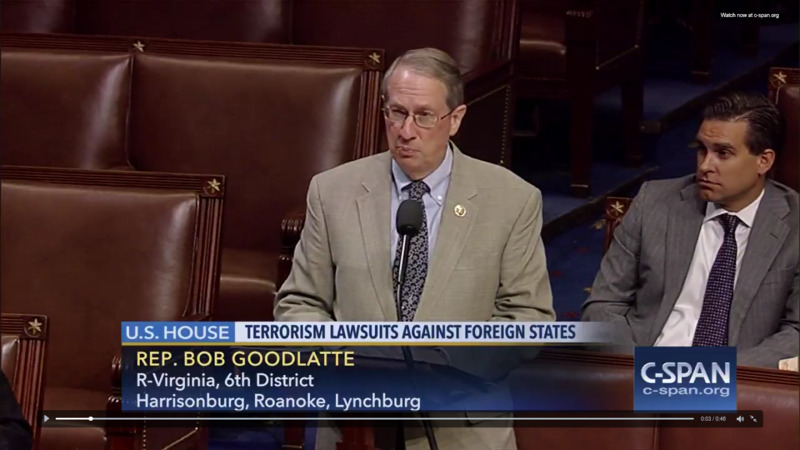 "This is not only a terrorist syndicate; it is a criminal enterprise." That's not entirely accurate. The World Trade Center in Clinton's adopted home state of New York was bombed in 1993 when her husband was president of the United States. In addition, although it was homegrown terrorism, most people would agree that the 1995 Oklahoma City bombing was also terrorism on the homeland". "The Mujahideen were the "database" of Al-Qaeda assets. Al-Qaeda are a controlled opposition force of the Central Intelligence Agency to promote their middle east destabilization process. To give empirical U.S. Military Industrial Complex a reason to invade wherever they want in the ever widening "war on terror" fraud." In an interview with the PBS NewsHour, CIA Director Leon Panetta said that although President Obama was watching some "real-time aspects" of the raid on Osama bin Laden's compound, he did not see the al-Qaeda leader being killed. JIM LEHRER: Did you have access to video of what was actually happening in the compound, etc.? LEON PANETTA: We had live-time intelligence information that we were dealing with during the operation itself. 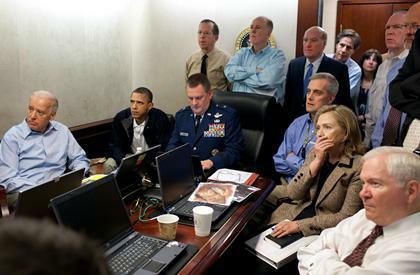 JIM LEHRER: Did you actually see - or did you actually see Osama bin Laden get shot? Bilderberg member Hillary Clinton arrived at Parliament today, and was welcomed by a protest featuring NZ911TRUTH. TVNZ aired footage of Mike Woods, who said "the evidence is overwhelming that the buildings [WTC 1, 2 & 7] were brought down by controlled demolition". 3NEWS - the music video and celebrity gossip specialists - did a poorer job by not airing the raw footage on live TV. Although, they did post raw footage on their website. In the online footage, TV3 filmed a clip showing Jade Tuckwell's sign, which read "Hillary's CFR pimps want to steal Iran's oil". 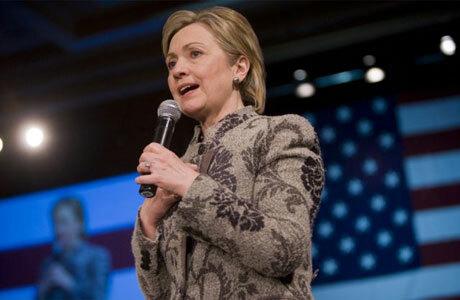 WASHINGTON -- U.S. Secretary of State Hillary Rodham Clinton said Sunday she thinks Iran will "pull some stunt" in the next few days because it expects further United Nations sanctions over its nuclear program. "They have consistently tried to avoid being held accountable," Clinton told reporters before leaving on a trip to Latin America. The U.S. suspects Iran is enriching uranium to build a nuclear warhead. Tehran denies this and insists on its right to a peaceful nuclear power program. The U.S. hopes to bring a fourth sanctions resolution to a U.N. Security Council vote this week. On Sunday, Clinton said, "I fully expect Iran to pull some stunt in the next couple of days because they know that sanctions are on the way." After some tough talk on Pakistan, US Secretary of State Hillary Clinton says some people in its government are aware of the whereabouts of elusive Al Qaeda leader Osama bin Laden and Afghan Taliban chief Mullah Omar. The Obama Administration meanwhile for the first time accused Taliban of being behind the botched Times Square bombing plot. "Some Pakistani officials were more informed about Al-Qaeda and Taliban than they let on", Clinton told CBS in an interview. those who attacked us on 9/11," she said. Will be archived here after the broadcast. Does Clinton blindly support the ongoing WAR ON GAZA? Is she a stalwart supporter of all Israeli policies? Barack Obama appeared on MSNBC's Hardball last night and was asked about the way he would handle the 3 a.m. phone call. MATTHEWS: Let me give you a scene that may face you in the next year or two, where the national security adviser calls you at 3:00 in the morning and tells that you a couple of jet -- commercial jets have been hijacked. And they believe it is al Qaeda. And, as we know, al Qaeda always tries a second time. They tried for the World Trade Center after '93. They came back in '01. They're heading for the Capitol. What do you do? MATTHEWS: But it has been predictable. OBAMA: Oh, well, the--I don't think anybody predicted 9/11. And, so, we don't know what kinds of circumstances are going to come up. Yup. 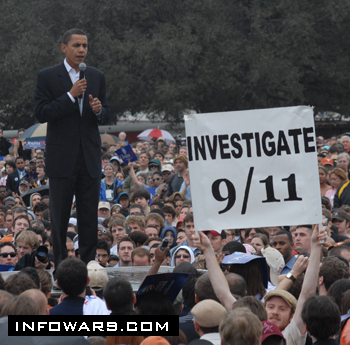 That's right, Barack Obama glibly stated that he didn't "think anybody predicted 9/11." Now that Hillary Clinton has been nailed in an outright fabrication of her role in Bosnia, it is time to remind ourselves of another, even more galling fantasy that Hillary tried to sell the voters. After 9/11, Hillary had a problem. New Yorkers were desperately focused on their own needs for protection and they were saddled with a Senator who was not one of them -- an Arkansasn or was it a Chicagoan? Interviewed on the "Today" show one week after 9/11, she spun an elaborate yarn. The kindest thing we could say was that it was a fantasy. Or a fabrication.